I was asked by several newbies if I would take some time to do a blog on building cutting boards that will cover the basics that may not get covered in the blogs/forums that detail how to do the real fancy boards that we all aspire to. So I’m going to try my best to hit the simple things that a novice trying to learn on their own may not think about or not realize until after they’ve made the mistake. It’s been a very long time since I’ve taken on a task like this – so please feel free to help me along. First I’d like to point out that my way is not the only way. My way works for me and can probably work for others – I don’t do anything that unusual – but since I pretty much taught myself – I may not be using the most conventional methods. I welcome all replies, suggestions or another explanation of what I’ve done. I know that the holidays are coming up and some are going to be making their first cutting boards so I’m going to try to get some of the blog moving along soon. However, as I said the holidays are coming and I have two large holiday shows that I’m doing this year so I’m in full building mode. I’ll do the best I can and I will, at the very least, get the simpler face grain and edge grain boards covered before Thanksgiving. My intent is to show all the warts, pimples and opps that I’ve made over the years and try to help those new to this wonderful hobby/sport/pastime to avoid the same. I’ll try to be picture heavy to help make up for any lack of literary clarity. Finally – just a bit of my philosophy – a very little bit. There is not one single cutting board made that I think has a mistake, or error, that cannot be “fixed” in some way. There are multiple ways to do so and I’ve used many of them and will show them as well. I detest throwing a board out – I fix it or repurpose the lumber if I absolutely don’t think I would like my fix. As examples – here are a few “mistakes” – fixed and sold within the last 2 or 3 years or so. The second one was supposed to be a “full sized” board – about 15×11 – but I had a crack in the middle of one slice. I cut the board in half at the offending slice and sold both halves as individual boards. 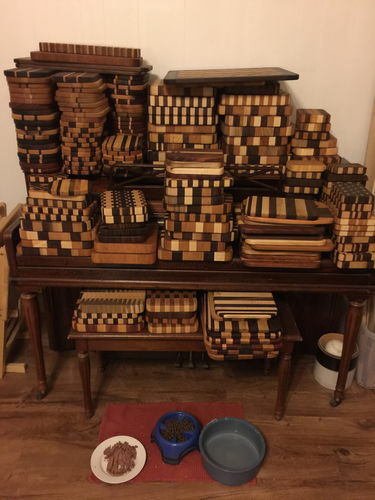 Not sure I should do this next thing – don’t want to be a thought of as a braggart – but I wanted to give you an idea of how many boards I’ve made within the last 3 months or so – this load is 284 of all sizes and types. A great many of these sold at my last two shows and from calls from former customers. (It’s hard to see but there are actually 2 rows deep of boards on top of the piano.) All but one or two of these boards are your standard flat, edge grain and end grain boards that are simple and fast. There are a few that are not as easy – but are doable. I have a pretty good system down that works well for me. I’ll try to share some of that as we go along. I hope you will come along for the ride. If anyone has questions or suggestions as I go along, as I’ve said, I welcome them. 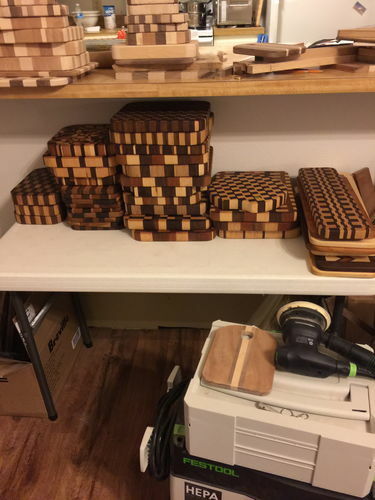 I would like to follow this blog and see how YOU make cutting boards…I am sure to learn something new… thanks for doing this blog…all the best from the land down under..
First off, thanks for doing this blog. 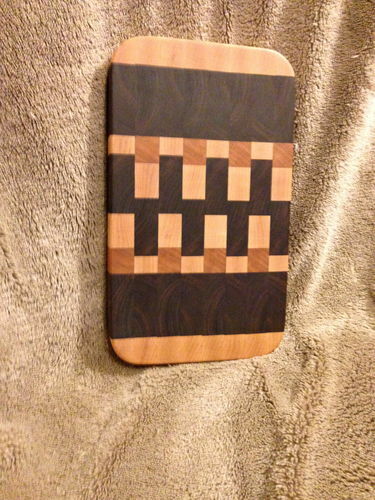 an end grain board, but need to crank out a few edge grain boards, for Christmas. Degoose – I bow down before your skill! I’d be honored to have your input/critique as I move along. I’m on the train too… I’ll be watching with great interest! I’ve gotten out of practice with edge and end grain and I know you’ll do a bang up job! I have had this on my to do list to learn. Thank you for taking time out of your busy schedule to help the newbies! Am I late for the ride? I hope not. Even though I’ve made quite a few boards, there’s ALWAYS ideas shared that I can stea … I mean LEARN from ! Thanks for the blog. I will be following it as I would like to add cutting boards to what I make. Count me in. I knew you were very good at making CB’s but I had NO idea you were as fast as you are too. I am very impressed. There is a lot of work in that many boards and you have done them well. I too would love to learn from you. Thanks guys – appreciate the compliments. 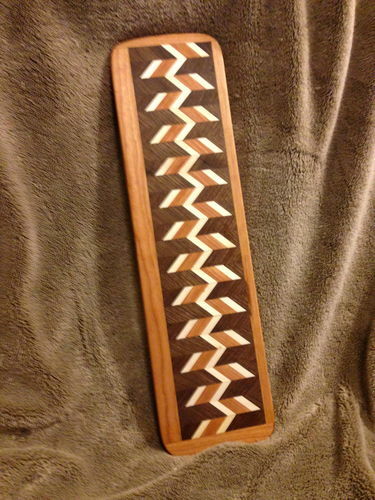 My intention is to get the face grain board portion on the site this weekend. I have several to build so I’ll be taking tons, maybe pounds, of pictures.